On January 30, we celebrate the Synaxis of the Holy Three Hierarchs and Ecumenical Teachers: Basil the Great; Gregory the Theologian; and John Chrysostom. The three Hierarchs belong to the Great Fathers of the Church because they used their excellent education to explain the Holy Scriptures to the people, so everyone could live a life in Christ. They are the Patron Saints of all levels of education, of teachers, and of students. In Greece and Cyprus, on their feast day, the Greek Letters are also celebrated. Schools organize festivities that include poems, plays, folk dance shows and similar activities. On this web page, we are providing material for teaching the specific feast. For more details about each Saint, you can refer to their individual web page. For the moment, we have only created extra material for St. John Chrysostom, which can be found on our page November Saints. As with every Saint, in addition to basic information about the three Hierarchs’ lives, we also want the children to remember that we should try to be like them, and that we can pray for them to intercede to Christ for us. For more details on teaching about the Saints, please visit our pages All About Saints and November Saints. We have been creating fact pages and calendar cards for all the Saints we have been working on. Fact sheets and cards from different Saints can be combined throughout the year, to make up a book or a large hanging calendar. More details and information on how to use them can be found on our page November Saints. We have provided an illustration that can be used to create an icon of the Saints, in the same way as we have done on our page about Saint Nicholas of Myra. 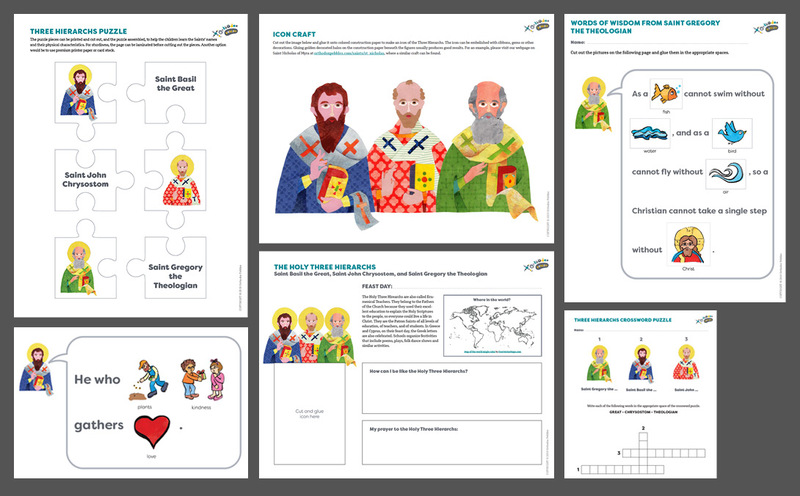 The puzzle pieces can be printed and cut out, and the puzzle assembled, to help the children learn the Saints’ names and their physical characteristics. For sturdiness, the page can be laminated before cutting out the pieces. Another option would be to use premium printer paper or card stock. It can be used to help the children learn the Saints’ names. Several illustrated activity pages with the Saints’ wise words have been provided. The children can cut and glue the pictures to make up the Saints’ sayings. Saint Basil the Great, Bishop of Caesarea in Cappadocia, 330-379 AD – Feast day: January 1. Saint Basil is called Great because he kept the correct faith, took care of the poor and needy, built monasteries, and explained the doctrines of the Church. Saint Basil wrote the text for the Divine Liturgy, which the Church uses ten times a year – mostly during the Great Lent. Saint Gregory the Theologian, Archbishop of Constantinople, 329-389 AD – Feast days: January 25, January 17 (translation of his relics). Saint Gregory is called Theologian because he explained the Holy Trinity as One God in Three Persons, Father, Son and Holy Spirit. According to one of his biographers, Saint Gregory is a Theologian because he prayed truly. He was a great poet and wrote over 400 poems containing more than 18,000 verses. Saint John Chrysostom, Archbishop of Constantinople, 347-407 AD – Feast days: November 13, January 27 (translation of his relics). Saint John is called Chrysostom because of the sweetness of his words. Read more about Saint John Chrysostom in our web page on November Saints. Fun Fact: The Church has given the title Great to a small number of Saints (Basil, Anthony, Athanasios, Constantine, Pachomios, Efthymios, Theodosios, to name a few); only three Saints are designated as Theologians (John the Apostle & Evangelist, Gregory, and Simeon the New Theologian); only one, John, as Chrysostom. They were Bishops of our Church. They wrote many books to explain the Orthodox Faith to the people and helped them live a life in Christ. They set rules to live and worship in the Orthodox way. They fought against heresies (= false teachings). They took care of everyone, obeying our Lord’s commandments. They were very well educated and loved learning. Saint Basil encouraged the students to be like the bee, which takes from the flowers only what makes good honey. They built many schools for all the children, rich and poor, and special schools for the people to find work. All three of their mothers are Saints – Emmelia (Basil), Nonna (Gregory), Anthousa (John Chrysostom); they are commemorated on the Sunday following the Great Feast of the Presentation of Christ in the Temple (February 2). All brothers and sisters of Saint Basil are Saints; his younger brother, Saint Gregory of Nyssa, is among the Fathers of the Church. The whole family of Saint Gregory are also celebrated as Saints. Hierarch: honorary title for a clergy of high rank. It comes from the Greek word Ιεράρχης: the chief priest. A hierarch is mainly a bishop (επίσκοπος, the overseer), who oversees the parishes within his assigned geographical area of jurisdiction. Ecumenical: that belongs to the ecumene (Greek, οικουμένη, the whole universe). Theologian: (from the Greek words: Θεός – God – and λέγω – to speak). Theologian means the one who, in prayer, explains things about God. Chrysostom: (from the Greek words: χρυσός – golden – and στόμα – mouth). Chrysostom is the golden mouthed, he who whenever he speaks, his words are precious like gold. The Holy Three Hierarchs lived in the mid-4th through 5th century AD. Even during their lifetime, they were greatly beloved by the faithful; their reverence only continued stronger through the centuries. At the end of the 11th c. AD, under the reign of Alexios Komninos, a dispute arose among the educated faithful as to who of the three hierarchs would be the greatest among them. ‘Zealots’ supporting each Saint even formed different parties, each bearing the name of their beloved Hierarch: the Basilians, the Gregorians, and the Johnites. The dispute among the three parties became so fierce that, on many occasions, heated arguments turned into real battles. Then, one saintly bishop, John of Efchaita, saw the Three Hierarchs in a dream, first one by one and later all together, telling him to order the quarreling parties to stop because, as they said, in Paradise, we are all participants in God’s Light and Glory; there is no space for competition. They asked Saint John to set a feast date for their common celebration and to compose hymns and prayers for the feast. Saint John did as he was told, and the Feast of the Holy Three Hierarchs was established to be celebrated on January 30, 1084 AD – and every year after that. Part of a 15th century icon of Saints Paraskeva (not shown here), Gregory the Theologian, John Chrysostom, and Basil the Great. Tretyakov Gallery, Moscow. [Public domain] via Wikimedia Commons. In their ιcon, the Three Hierarchs are standing in their hierarchical vestments, each holding a Gospel Book. In many icons, they are also depicted with their right hand raised in a gesture of blessing. Saint Basil the Great has dark hair and a long dark beard (we are reminded that he reposed at the age of 48). Saint John Chrysostom, usually standing in the center, has short dark hair and beard. Saint Gregory the Theologian has white hair and his beard is thick in an almost square shape. All three have ascetic figures from the lifelong askisis (physical and spiritual struggle to holiness). Troparion of the Feast in Greek by Fr Nikodimos Cavarnos. Troparion of the Feast in English by the Monks of the Holy Transfiguration Monastery, Boston, MA. If every man took only what what was sufficient for his needs, leaving the rest to those in want, there would be no rich and no poor. Every divine action begins from the Father, proceeds through the Son, and is completed in the Holy Spirit. Everyone looks for the good, therefore, everyone looks for God. O sinner, be not discouraged, but have resource to the Theotokos in all your necessities. Call Her to your assistance, for such is the divine Will, that She should help in every kind of necessity. If you begin to guard wealth, it will not be yours. But if you begin to distribute it, you will not lose it. The bread you store up belongs to the hungry; the coat that lies in your closet belongs to the naked; the gold you have hidden in the ground belongs to the poor. They who sow courtesy reap friendship, and those who plant kindness gather love. We need not only read Holy Scripture, but learn it as well and grow up in it. Realize that nothing in Scripture is written unnecessarily. As a pilot of a vessel is tried in the storm; as the wrestler is tried in the ring, the soldier in the battle, and the hero in adversity: so is the Christian tried in temptation. He takes upon Himself the poverty of my flesh so that I may receive the riches of His divinity. These three things God requires from all the Baptized: right faith in the heart, truth on the tongue, temperance in the body. I cannot think on the One without quickly being encircled by the splendor of the Three; nor can I discern the Three without being carried straight away back to the One. A faithful friend is more precious than gold; he is a fenced garden, a seaport of repose, mighty protection, and living treasure. We are not made for ourselves alone, we are made for the good of our fellow creatures. Honor your homeland, and help her with all your virtue. Prayer is the place of refuge for every worry, a foundation of cheerfulness, a source of constant happiness, a protection against sadness. Be ashamed when you sin, do not be ashamed when you repent. No matter how just your words may be, when you speak with anger, you ruin all: no matter how boldly you speak, how fairly reprove, or what not. Let us always guard our tongue; not that it should always be silent, but that it should speak at the proper time. The bee is more honored that the other animals, not because she labors, but because she labors for others. It is impossible to be saved without the help of the Most Holy Virgin, because those who are not saved by the justice of God, are saved by the intercession of the Theotokos. God loves us more than a father, a mother, friend, or anyone else could love, and even more than we are able to love ourselves. We are commanded to have only one enemy, the devil. With him never be reconciled! But with a brother, never be with enmity in your heart. Be the Bee, episode 47, from the Youth and Young Adult Ministriy of the Greek Orthodox Church of America. Coffee with Sister Vassa, episodes 36 and 39. Article on the Feast, Greek Orthodox Archdiocese of America. Who are the Three Hierarchs? by Fr Michael Shanbour of the Antiochian Orthodox Archdiocese of America. The titles of the Saints in the Orthodox Church, by Fr Andrew of St John Orthodox Church, ROCOR England. Icon of the Three Holy Hierarchs from A Reader’s Guide to Orthodox Icons. Special thanks to Sister Vassa Larin and to Υ2ΑM for allowing us to embed their videos into our web page.